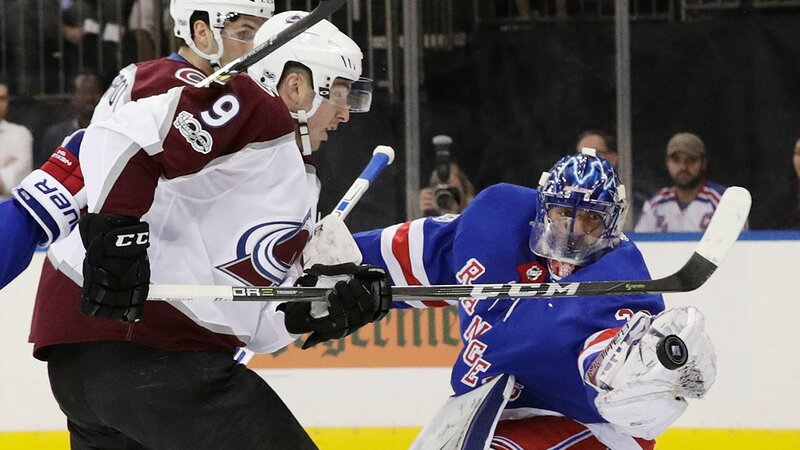 NEW YORK (WABC) -- It was a disappointing start to the season for the New York Rangers, as they dropped their opener to the Colorado Avalanche 4-2 Thursday night. It almost seems as an extension of last season. The Rangers had multiple scoring opportunities, but just couldn't get the puck past the Colorado net minder Semyon Varlamov. As head coach Alain Vigneault said after the game; "Best player on the ice was their goaltender tonight". Varlamov made 37 saves, and frustrated the Blue Shirts especially down the stretch. The Rangers came out flat in the first 10 minutes of this game. As a result, Colorado jumped out to a 2-0 lead in the first 11 minutes of this contest. Defensively, the communication was lacking. Following the game Rick Nash said; "The focus will be on our defensive game, we gave up too many odd man rushes." Matt Duchene lit the lamp first to get things going. He would later add an assist on an empty net goal. Duchene had been the subject of trade rumors, and continued to solidify his value. Kevin Shattenkirk made his debut on Broadway Thursday night, and made a strong pass on the power play to Mika Zibanejad for the Rangers first goal. Zibanejad would score later in the first, again on the power play. The power play was a bright spot for the Rangers as they battled strong in the corners to create chances, and get traffic in front of the net. But defensively Shattenkirk said; "We need to tighten up, we need to be a little more patient. We did turn pucks over in the neutral zone, and we let up a lot of odd man rushes tonight." The Rangers still have some adjustments to make overall. Reiterated by Henrik Lundqvist; "The result was not what we were looking for, but a lot of good things to build on." It will most likely take the month of October to figure it out. Their first 10 of 13 games are to be played at Madison Square Garden. A valuable time to establish home ice advantage.